American actor and stand up comedian Robin Williams was renowned for his improvisation skills and quicksilver wits which made him a national treasure in his country. Even though he was basically a comedic actor, he also took on serious dramatic roles in several movies and TV series. Some of his most enduring movies include Dead Poets Society, Good Morning, Vietnam, Mrs. Doubtfire, The Birdcage, Aladdin and Good Will Hunting. Williams sadly ended his own life in 2014. Get to know more about this comedy genius here including his bio, life accomplishments, children, net worth etc. Robin McLaurin Williams was born on July 21st, 1951 in Chicago, Illinois. His mom, Laurie McLaurin was a Mississippi native and was formerly a model while his dad, Robert Fitzgerald Williams was a native of Indiana and a high-level executive at Ford Motors. The actor had a rich ethnic heritage comprising of Welsh, English, Irish, German, French and Scottish ancestry. The late comedian had his education at several public and private schools (due to the fact that the family moved around a lot) and by the end of his high school education, was voted the funniest person in his class. For his college education, Robin Williams enrolled at the Claremont McKenna College to study political science. He, however, dropped out after a while to pursue his first love which was dramatic arts. He studied theatre for some time at a community college in Marin before proceeding to the prestigious Julliard School. He spent three years at Julliard (1973 to 1976) honing his acting and comic skills. See Also: Robert De Niro Children, Wife, Family, Net Worth, Height, Is He Dead? Following his father’s retirement in 1969, the Williams family relocated to and settled down in San Francisco, specifically Marin County. When Williams left Julliard in 1976, he returned home and started performing stand up comedy at various nightclubs in San Francisco. From there, he moved to Los Angeles where he was discovered by TV producer, George Schlatter who gave him a role in the NBC sketch comedy television program Laugh-in. This marked Williams’ entry into the world of professional acting. The project that thrust Williams into the limelight was the ABC sitcom Happy Days where he played an alien named Mork in the 110th episode of the show. The character proved so popular with the viewing public that it got its own spin-off series, Mork and Mindy, which ran for five years between 1978 and 1982. Williams also landed on the cover of Time Magazine as well as Rolling Stone in 1979 thanks to the character. In a career spanning over 30 years, Williams appeared in several highly acclaimed comic and dramatic movies. They include Good Morning, Vietnam 1987, Moscow on the Hudson 1984, Dead Poets Society 1989, The Fisher King 1991, Good Will Hunting 1997, Insomnia 2002 and One Hour Photo 2002. As a testament to his diversity, Williams also appeared in several animations and children movies. They include Hook 1991, The Last Rain Forest 1992, Aladdin 1992, Jumanji 1995, Happy Feet 2006, Night at the Museum 2006, World’s Greatest Dad 2009. In addition to his successful Hollywood career, Robin Williams also continued as a stand-up comedian throughout his life, embarking on several tours. They include An Evening With Robin Williams (1982–83), Robin Williams: At The Met (1986) and Robin Williams: Live on Broadway (2002), Weapons of Self-Destruction (2008). Robin Williams received several awards in the course of his career. He won the 1998 Oscar for best supporting actor for his role as a therapist in the movie Goodwill Hunting. Other awards include the Golden Globe award for best actor in a television series musical or comedy for Mork and Mindy in 1979, Golden Globe award for best actor in a motion picture musical or comedy for Good Morning Vietnam in 1988, Golden Globe award for best actor in a motion picture musical or comedy for The Fisher King in 1992, Golden Globe award for best actor in a motion picture musical or comedy for Mrs Doubtfire in 1994. He received a total of seven Golden Globe awards, two Screen Actors Guild awards and two Primetime Emmy awards. Robin Williams also won a total of four Grammy awards, all for the best comedy album, in 1980, 1988, 1989 and 2003. He is credited with spearheading the renewal of stand up comedy in San Francisco in the 1970s and has also inspired a new generation of comedians including the likes of Jim Carrey, Judd Apatow etc. He was also a philanthropist; together with good friends Whoopi Goldberg and Billy Crystal, he founded Comic Relief USA in 1986. The charity helps needy people especially homeless ones. Williams also performed on several USO tours for American troops serving abroad. He was awarded a star on the Hollywood walk of fame in December 1990. Robin Williams left an estate estimated at between $50 and $100 million. His estate includes real property (a Napa Valley mansion listed at $29.9 million and a $5 million house in Tiburon, California), arts as well as other investments. Williams’ estate was the subject of a court dispute between his wife and three children in 2015. The dispute was eventually settled out of court. Williams has a clause in his will which stipulates that his image cannot be sold for use in commercials, endorsements etc for 25 years after his death. 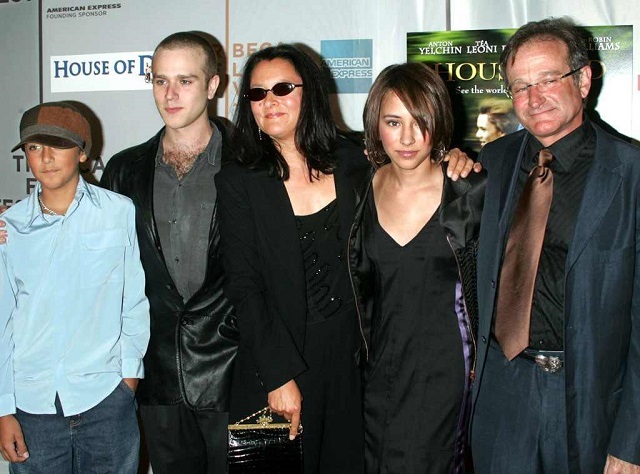 In the course of his life, Robin Williams got married thrice and had three children in total. His first marriage was to Valerie Velardi in June 1978. The union produced a son, Zachary Pym Williams, known as Zak, in 1983. Williams and Velardi divorced in 1988. His second marriage was to Marsha Garces (who had been Zak’s nanny) in April 1989. They had two children together, daughter Zelda Rae in 1989 and son Cody Alan in 1991. Garces and Williams divorced in 2008. Williams then married his third wife, Susan Schneider in October 2011. They were together untill his death in 2014. Williams’ daughter Zelda is a budding actress. Williams passed away on the 11th of August 2014 at his home in Tiburon, California. A final autopsy report confirmed that his death was a suicide due to asphyxia i.e. he hung himself. His suicide has been attributed to a number of factors, including a stalling career as well as a devastating diagnosis of Parkinson disease in May 2014. It later turned out that he was misdiagnosed. He was not suffering from Parkinson but Lewy Body Dementia, a Parkinson’s-like aggressive and incurable brain disorder that has an associated risk of suicide. His death was a shocking loss to the world and many paid tributes to him. Leading the tributes was then President, Barack Obama. Williams was cremated and his ashes scattered over San Francisco Bay on the 12th of August 2014. He was 63 years old at the time of his death.